My dog always seems to have fleas. What can I do? Successful flea control involves both eliminating fleas from your dog and controlling fleas in your environment. Dogs and cats share the same fleas, and fleas can travel from one animal to another. Thus, it is important that all pets in your home are on a flea preventive program. Treating your pet for fleas has never been easier. With the many choices we have today, we can provide you with the safest and most effective flea preventive for your pet's needs. However, when it comes to environmental control, it is important to understand the flea life cycle. What is the life cycle of the flea? 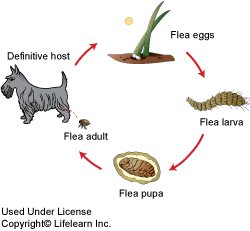 There are four stages to the flea life cycle, namely the egg, the larva, the pupa and the adult. Flea larvae are about 2-5 mm (1/8" to 1/4") in length. They have a whitish body and a black head. They feed on organic debris found in their environment and on adult flea feces. They dislike bright light and move deep into carpet fibers or under furniture, organic debris, grass, branches, leaves and soil. Flea larvae prefer warm, dark and moist areas. Outdoors, larval development occurs only in shaded, moist areas where flea infested pets spend a significant amount of time. Our climate-controlled homes offer an ideal environment for the flea larvae to thrive. The flea pupae produce a protective silk-like cocoon that is sticky. It quickly becomes coated with grime and debris, which acts as a useful camouflage. With warmth and humidity, pupae become adult fleas in 5-10 days. The adults do not emerge from the cocoon unless stimulated by physical pressure, vibrations, carbon dioxide or heat. This is important since once fleas emerge from the cocoon they can only exist for a few days unless they are able to feed. Pre-emergent adult fleas can survive within the cocoon for up to 9 months. During this time they are resistant to insecticides applied to the environment. This is important to remember because adult fleas may emerge from their pupae into the environment a considerable time after you apply insecticides in your home. Once it emerges, the flea adult, unlike the larvae, is attracted to light and heads to the surface in order to encounter a passing host to feed upon. Two days after the first blood meal, female fleas begin egg production. In normal circumstances the adult female will live up to three weeks, laying approximately 40 eggs per day. The entire life cycle, from egg to adult flea can be completed in as little as 14-28 days depending on environmental conditions. Apart from irritation, are fleas particularly harmful? 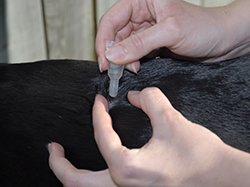 Fleas can cause anemia in heavy infestations, especially in young or debilitated dogs. A single female flea can consume up to 15 times her body weight in blood over the several weeks of her adult life. 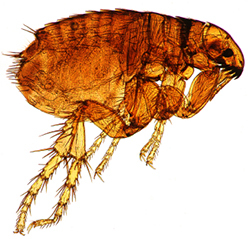 In addition, fleas can carry several diseases, including plague, and act as vectors (hosts) to spread one of the most common tapeworms of the dog and cat, Diplylidium caninum. How do I prevent fleas on my dog? Successful flea control includes treating both your pet(s) and the environment. What should I put on my dog? Shampoos, sprays, powders and topical preparations are all available. There are also very effective products designed for monthly administration that are available through your veterinary clinic; some of these products are conveniently combined with medications to prevent heartworm and intestinal worms. Be sure to consult your veterinarian to choose the most effective and safe flea products for your home and pet. Environmental preparations are becoming increasingly sophisticated. Most "quick kill" products are only effective against the adult flea. Your veterinarian can provide you with flea products that contain Insect Growth Regulators (IGR) that will prevent maturation of the flea eggs and larvae in addition to chemicals that will kill the adult fleas. "Before applying any environmental product, we recommend vacuuming your carpet to stimulate the pre-adult fleas to emerge from their protective cocoons." Before applying any environmental product, we recommend vacuuming your carpet to stimulate the pre-adult fleas to emerge from their protective cocoons. Be sure to discard the vacuum cleaner bag after its use. My dog lives most of his life outside. What should I do? Concentrate on dark, shaded areas and the areas he sleeps in, including his bedding. Spray a product containing an IGR and repeat every 14-21 days for three to five applications. The newer topical and oral flea preventives will greatly assist you in solving your flea problem. And, by understanding the flea life cycle and following our advice, you and your pet will be flea free in no time.